The College of Humanities and Social Sciences honored its outstanding faculty and staff members during its annual fall meeting. 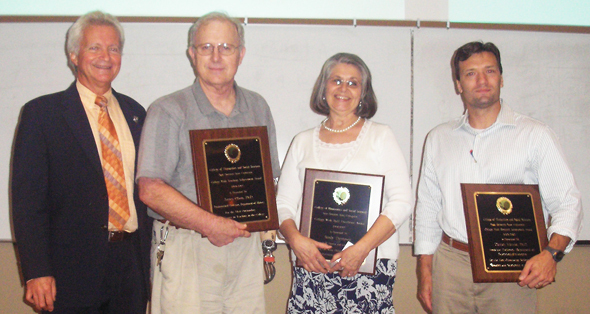 From left are John de Castro, dean of the college; Jim Olson, Outstanding Teacher Award; Sandy Thompson, Staff Excellence Award; and Dan Murrie, Outstanding Researcher Award. Jim Olson, Dan Murrie and Sandy Thompson were honored for their outstanding work in the College of Humanities and Social Sciences during the college's annual fall meeting. Olson, distinguished professor in the Department of History and winner of all three of the university's excellence awards (teaching, research and service), was presented the college's Outstanding Teacher Award. He has also won the Carnegie Foundation's Texas Professor of the Year and the Texas State University System Distinguished Professor awards. John de Castro, dean of the college, referred to an Olson comment that he hoped to be remembered for, and the true worth of his career would be measured by, his teaching rather than the many books he has written. "He need not worry," said de Castro. "His teaching has left an indelible mark on all of his students and on his colleagues." Murrie, assistant professor in the Department of Psychology and Philosophy, was presented the college's Outstanding Researcher Award. He is credited with more than $466,000 in outside research funding, while publishing eight articles, one book, and two book chapters. He is also noted for sharing his expertise in and love of research with his students, involving both graduates and undergraduates in his projects. "Dan Murrie has established himself as a premier researcher in psychology, and his research has provided excellent learning opportunities for our students," said de Castro. Thompson, departmental secretary for the Department of Family and Consumer Sciences, was presented the Staff Excellence Award. With 14 different programs and more than 300 majors, Thompson's department is considered one of the most complex in the college. Janis White, who chairs that department, praised Thompson's "excellent organization and communication skills." "She can do everything," said White, "from unjamming the copier to producing beautiful visual displays at holiday times to organizing a retreat on a tight budget. Her unflappable style and strong people skills help keep the department and its majors on an even keel." The college also recognized nine additional faculty for outstanding teaching and nine for excellence in research. Those honored for teaching in addition to Olson were Kim Bell and Kandi Tayebi from English, David Gerling from foreign languages, Claudia Sealey-Potts from family and consumer sciences, Chris White from mass communication, Masoud Kazemzadeh from political science, Craig Henderson from psychology and philosophy, Doug Constance from sociology and Rick Bello from communication studies. Those honored for research in addition to Murrie were Melissa Morphew from English, Rafael Saumell-Munoz from foreign languages, Paula Tripp from family and consumer sciences, Ruth Massingill from mass communication, Susannah Bruce and Terry Bilhartz from history, Sarmistha Mujumdar from political science, Karen Douglas from sociology and Francis Brandau-Brown from communication studies. De Castro said that in the past year researchers in the college have brought in more than $3.3 million in funding, have more than doubled research production, and made special efforts to include students in research and the resulting presentations and publications.